IEx-treme Softening: Are There Upper Limits on TDS for Conventional Softeners? The conventional cation exchange softener can soften seawater and can also be regenerated with seawater. How does this work? It’s called equilibrium. Understanding the equilibrium forces that drive the softening reactions may open new horizons for treating water for a variety of commercial and industrial applications. 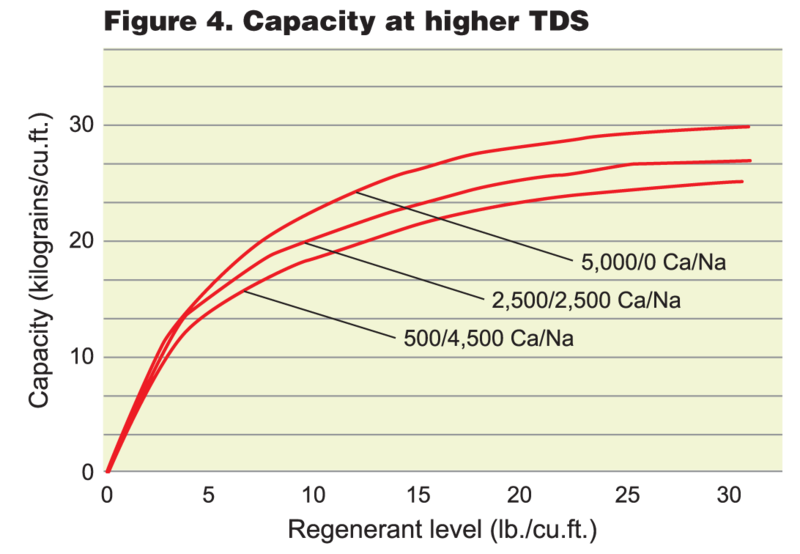 This article will look at the variables of hardness-to-sodium ratios, total TDS and just what is going on as water travels down the column of a conventional salt regenerated system. Equilibrium is what makes it possible to use the same basic resin system design to soften seawater or use seawater as the regenerant. But, you can’t do both at the same time! If you are softening seawater, you need to use a very concentrated brine in a counter-flow mode to clean the resin sufficiently so as to have a balance of driving forces that will now pull hardness from a very high TDS (seawater = 35,000 TDS) feed. On the other hand, when seawater (now it would be considered a diluted brine of about 3.5 percent) is used to regenerate, considerable hardness is left behind on the resin. There is a limit in the subsequent TDS of the feed that can be processed. To obtain acceptable performance for a softener using seawater to regenerate, we are limited to a feed of no more than about 450 TDS. The selectivity of Ca++ to Na+ is 1.9:1 in dilute solutions. This drives a softener. However, as the concentration of Na+ increases to that of brine, this selectivity shifts towards sodium. This drives the regeneration. The concentration gradient determines which way the reaction proceeds (see Reaction 1). RO reject concentrate has successfully been used to regenerate softeners used in the same plant. High hardness in the water and a freshly regenerated resin (high sodium) promote the softening reaction. However, there is a bottom side to this relationship. 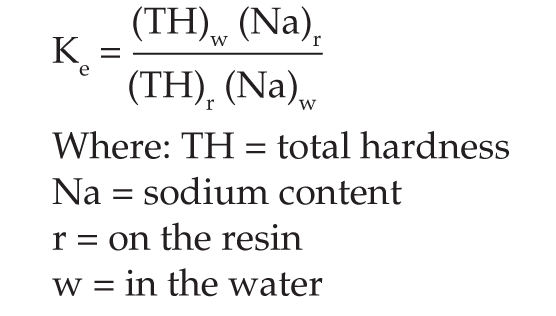 Pushing the other way to slow the reaction (or even stop it) is the amount of hardness contained in the resin and the amount of sodium in the water. 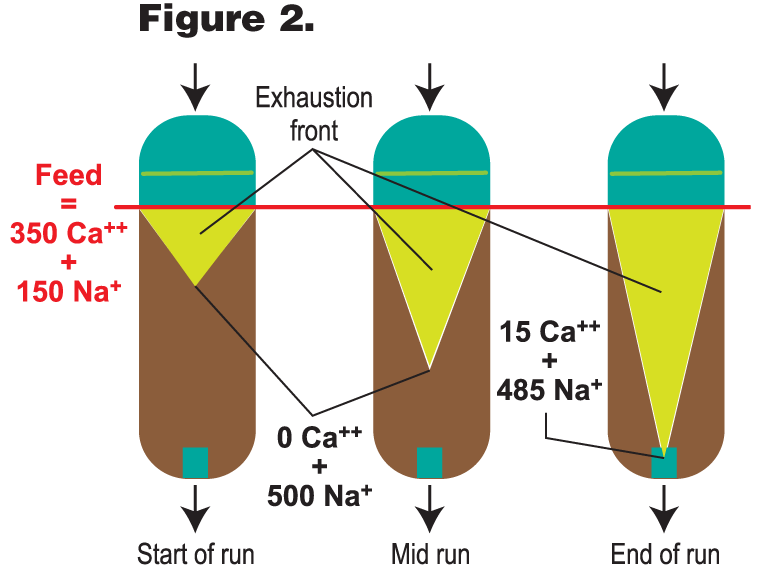 Capacity is not solely a function of hardness in the feedwater but also the sodium, TDS, desired leakage (cutoff), salt (regenerant) dosage and hardness/sodium ratio. We are all familiar with the frequently used charting of softening capacity and leakage versus salt dose (Figure 1). For the most part, I would call this a trend-line curve showing the direction in which things improve. This curve is only true for one very specific set of variables: 250 ppm total hardness, 250 ppm sodium and a flow rate of two gpm/cu. ft. It will, however, put you in the ballpark for most feedwaters encountered from municipally supplied sources; that is, those with a TDS of 1,000 ppm or less and hardness of about 20 gpg. reaction is retarded. The hardness/sodium ratio of the feed plays a key role in determining softener performance. 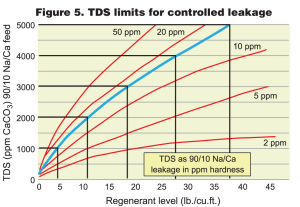 TDS and TH/Na ratio are the only two major feedwater composition variables (the ratio of calcium to magnesium is also a factor but there has been very little investigation as to the impact on hardness capacity and leakage). Magnesium, however, does have a lower selectivity (1.7 versus 1.9) than calcium, and one would expect that a high magnesium water would be more difficult to soften. For each shift in the feed TDS and the TH/Na ratio, there is a different version of the softening curve (Figure 1). The leakage cutoff is an operational variable that helps determine the salt dosage required to achieve performance. This can be seen in Figure 1 by projection of the desired leakage values on the right side down to the dosage value at the bottom. High salt levels lower the leakage and thus, extend the production run. 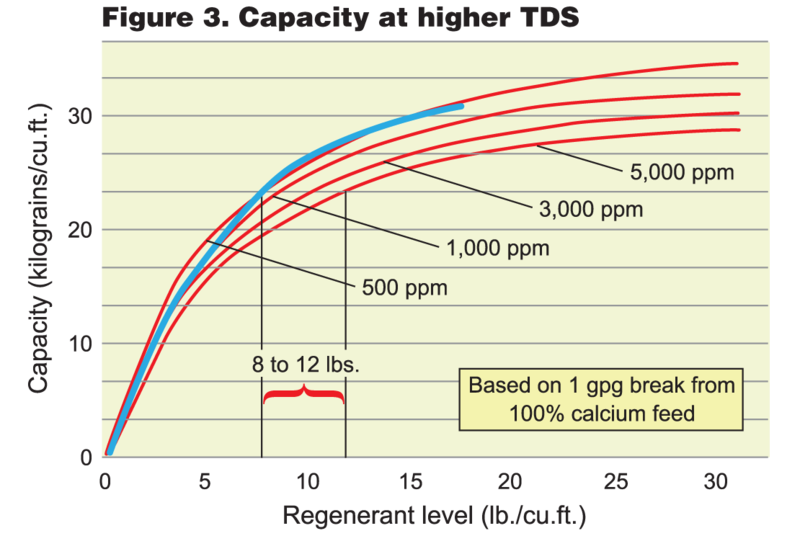 If capacity decreases and leakage increases with increased TDS, is there a limit where the softener no longer works? Let’s go inside the tank and see what happens. 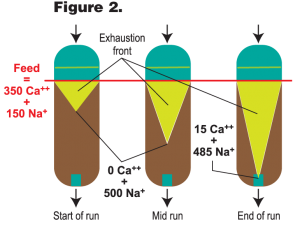 As hard feedwater enters a softener, divalent calcium (Ca++) and magnesium (Mg++) ions are attracted to the negatively charged exchange resin in the sodium (Na+) form. Since the attraction for the divalent is stronger that that of the monovalent, the hardness ions are pulled to the resin where they attach, exchanging for sodium. As the feedwater flows deeper into the bed, it becomes increasingly richer in Na+ and lesser in Ca++ and Mg++. 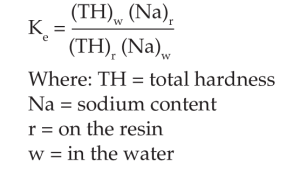 At some point late in the service run (Figure 2), enough sodium has been stripped from the resin so as to reduce its driving force to enter the solution. At the same time, the hardness is sufficiently low in the solution that it can no longer enter the resin bead. By now, the top of the bed (which has seen the bulk of the hardness) is exhausted and the hardness wave has moved down the column to the point where hardness is beginning to leak through. As the run continues, and the bed continues to further exhaust, effluent hardness rises. When the effluent hardness exceeds our desired level, the run is over and the bed is regenerated to restore capacity. Although the breakthrough level impacts the length of the service run, the breakthrough curve is very steep. A run that may yield 1,200 gallons of service to a one-gpg break may only produce 1,250 gallons to a five-gpg break. The ion exchange softening reaction is very rapid (in seconds). That is why the softener can produce good quality over a wide range of feedwaters right up to the point of exhaustion. NOTE: there is a difference between leakage and breakthrough. For economy, we never completely regenerate a softener. That would require more than 50 lbs. of salt/cu. ft. As a result, a small amount of the resin is left in the hardness form. With co-current regeneration, this portion of the bed is usually at the bottom (which sees the weakest brine solution during regeneration). As the next service run begins, the TDS of the feed is converted to nearly 100-percent sodium. This increase in sodium content becomes great enough to partially regenerate some of that residual hardness off the bottom of the bed where it enters the effluent stream. This is what we call leakage. It will actually get lower as the run continues (known as rinse up) and will remain at its lowest level just before exhaustion. 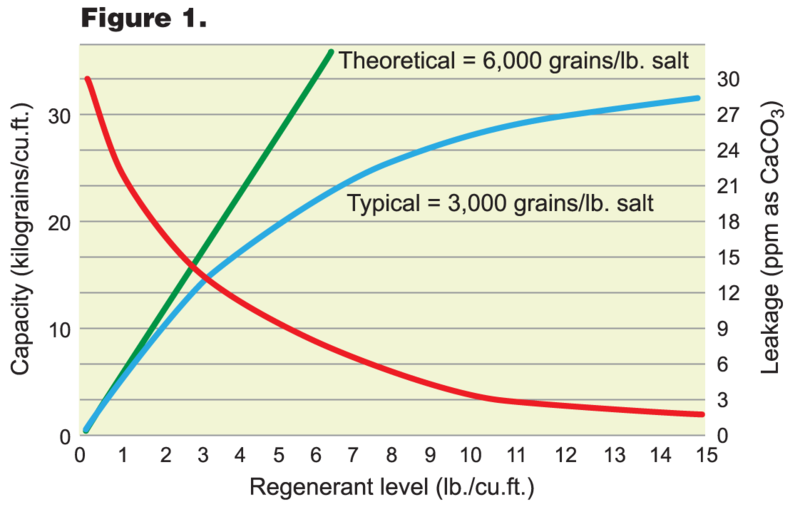 Leakage is highly dependent on the level of salt used in regeneration, since the amount of salt directly influences the residual hardness left behind (to produce leakage). When the bed can no longer remove the hardness load from the influent stream, and it begins to show up in the effluent stream, this is breakthrough. The point in the run where breakthrough occurs is negatively impacted by the flow rate through the softening bed. Higher flows will shorten the run length because the exhaustion front extends farther down the bed. Do I have to engineer each softener differently? Fortunately not. When the feedwater is in the middle of the road, most in-themiddle-of-the-road softener designs will function quite well. In other words, it is hard to make a mistake (as long as you only have to soften to < one gpg and brine efficiency is not an issue). Most residential systems are based on one-cubic-foot units and rated at 10 to 12 gpm. Brine flows are unfortunately fast, resulting in rather poor brine efficiency. Industrial systems (those requiring optimum leakage and 24/7 performance schedules) have more efficient designs. A short brine contact time, especially at lower salt settings, is the primary shortcoming of the automatic residential design. What is the impact of TDS on softener capacity? 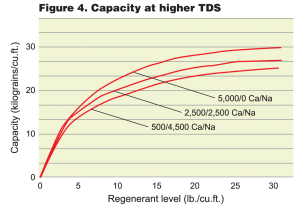 Figure 3 shows the variable capacity influenced by increasing TDS. The superimposed blue curve is the original graph from Figure 1. Over a TDS increase from 500 up to 5,000 ppm, capacity is reduced about 20 percent. 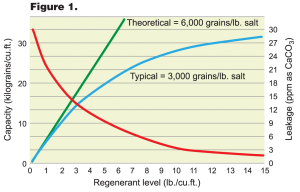 Figure 4 shows the influence of hardness/sodium ratio for three different feed compositions. The high-sodium (9:1) blend shows a capacity almost 30 percent lower than our standard chart given as Figure 1. Still, that doesn’t seem all that bad for such a high TDS challenge. To explain why higher TDS feedwaters are so difficult to soften, one has to look at the leakage that goes along with the capacity (See Figure 5). The blue curve represents one-gpg leakage. 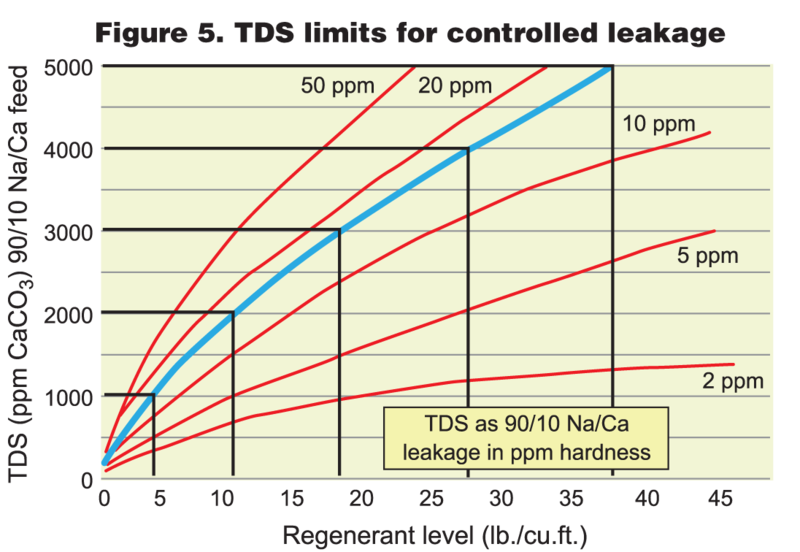 Figure 5 is a simplified charting of typical leakage versus TDS with a 90/10 Na/TH feed. This shows the salt levels needed to achieve at least one gpg minimum leakage. The curves for higher hardness ratios are slightly better. What this curve says is that you need a minimum of about 4.5 lbs. NaCl/cu. ft. to achieve softening in 1,000 TDS feed. You will need to raise that to 11 lbs/cu. ft. in 2,000 TDS, 18.5 lbs. in 3,000 TDS, 28 lbs. in 4,000 TDS and 37.5 lbs. in 5,000 TDS. Putting two units in series does no good since the feed to the polisher is still the same TDS and the Na/TH ratio is higher, making things worse. So how do you soften high TDS water and get satisfactory leakages? There are three things to consider. For the industrial market, series softening has long been the fall-back to treat those high TDS waters, such as produced water from oil production. This water tends to be moderately low in hardness (200 to 300 ppm), but high in TDS (2,500 to 8,500). 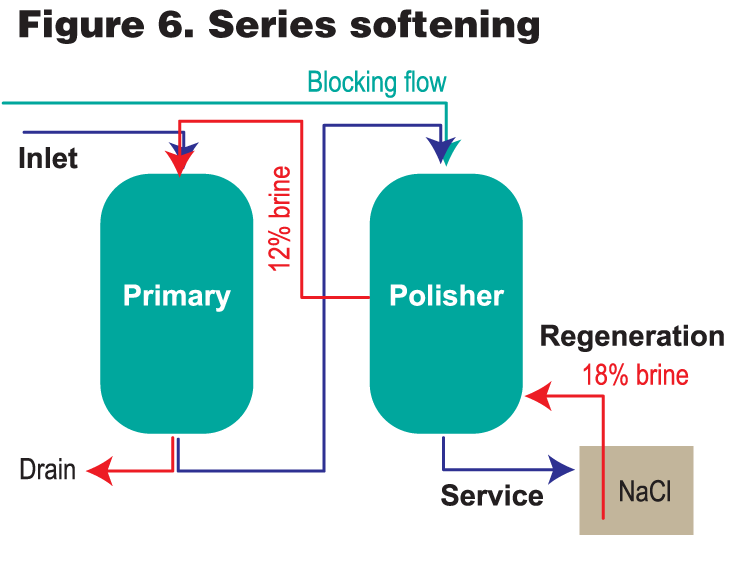 With series softening (see Figure 6) we have a primary and a polishing softener. They need not be the same size and often the polisher is smaller. 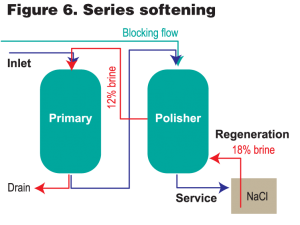 During regeneration, the total brine (for both units) is passed counter-flow through the polisher at 18-percent concentration using a blocking flow of water to hold the bed in place. The blocking flow also dilutes the brine to between 10 and 12 percent where it exits through a collector lateral and is then passed through the primary in a co-flow mode. Typical salt levels are 20 lbs./cu. ft. and the capacities range from 18,000 to 22,000 grains/cu. ft. while achieving < one ppm leakage through the polisher. These systems are usually pulled offline when the primaries break through, so as not to work the polisher. 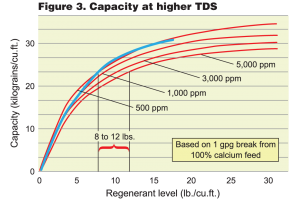 The typical leakage through the primary on 3,000 TDS feed is 14 to 17 ppm. Since the polisher sees the regenerant brine at the bottom of the bed, it is essential to use a low-hardness salt. Otherwise, the hardness will be captured by the bottom of the polisher and show up as higher leakage in the service run. It is also essential to hold the polishing resin in place during brining to avoid mixing the bed. For industrial systems with > 5,000 TDS, a weak acid cation polisher is almost always used. The weak acid is regenerated with acid and then neutralized with caustic to run it in the sodium form. Leakages below one ppm in waters up to 10,000 ppm are common. Weak acid resins (WAC) can be used in residential markets, but only if they are installed as portable exchange units and regenerated off site due to the nature of the regeneration chemicals. While series softening is not practical for home use, counterflow regeneration is. Leakage values derived through counterflow regeneration are only about 10 to 15 percent of co-flow regenerated units. That means you can get less than one-gpg leakage from a conventional system using eight lbs. of salt/cu. ft. in feeds all the way up to 5,000 TDS. Capacity would be about 18 Kgr/cu. ft. Use a small injector with a slow flow rate in order to not disturb the bed during regeneration and minimize the length of the backwash to prevent mixing of the bed. With counter-flow, it is important to keep the polishing zone at the bottom as clean as possible. Set a generous reserve capacity in order not to exhaust the polishing zone at the bottom. A third suggestion for coping with high TDS waters is to look into different resin configurations. Uniform bead resins will allow higher levels of regeneration at the bottom of the bed even in co-flow modes. This is due to the lack of fine beads at the top so more of the brine makes it to the bottom. Fine mesh beads regenerate more rapidly and use up more of the regenerant. A better regeneration at the bottom will produce lower leakages, and should provide good performance with conventional systems up to 2,500 TDS and 10 lbs./cu. ft. Counter-flow is even better. Fine mesh resins give a better response to regeneration and will produce higher capacities and lower leakages as a result. Fine mesh resin regenerated at the 10-lb./cu. ft. level should provide satisfactory softening up to 3,000 TDS. Above that level, counter-flow is suggested. Shallow-shell resins made by one manufacturer are designed to give a maximum response at any level of salt. Due to the lack of hardness penetration into the bead during service, they are more readily regenerated at all salt doses. Better regeneration means lower residual hardness left on the bead, which translates to lower leakage. This allows the shallow-shell resins to be run in harsher service with higher hardness and higher TDS, while maintaining lower leakages. The leakages obtained with the use of shallow shell are 70 to 80 percent lower than with conventional beads. For residential needs, soft water should not be considered purely a luxury. Preventing scale buildup in pipes, heaters and fixtures reduces energy consumption and maintenance. As the Battelle Study (see www.wqa.org) recently demonstrated, soft water is one of the biggest energy savers the homeowner can employ. These benefits can be readily achieved, even with slight leakages of hardness. A softener should be sold as an appliance to protect all the other appliances and not as the cure for the common cold. Zero hardness should not be the sole guideline for the sale. Yes, it is doable, but it will be wasteful and costly to maintain. Industrial softeners are used to facilitate downstream processes, which may require the reduction of feedwater hardness to below one ppm. This is not easily done in feeds with elevated TDS without considerable design engineering. An industrial softener is not simply a larger version of the residential model. The ace up the sleeve for industrial designs is often simply the use of higher salt dosages. Salt efficiency is often not as important as removal efficiency, and operating costs are not as important Figure 6. Series softening as maintenance or replacement costs. Series softening and the use of WAC polishers lend themselves to the industrial mindset. Don’t be intimidated by the higher costs and complexities of a well-designed industrial proposal for softening high TDS water, and make sure your potential user understands that you aren’t simply trying to fluff up the quote with a lot of unnecessary equipment. The equilibrium conditions that exist between water composition and the resin’s ionic composition pretty much guarantees that you will not always produce a zero-hardness effluent. This is especially true as the TDS of the influent increases above 1,000 ppm. Good hydraulic designs for brine and service flow distribution and a bed depth of at least 30 inches will help to maintain hardness below one gpg up to about 2,000 ppm TDS. Beyond that, the use of a counter-flow design will provide good operation up to about 5,000 TDS. Industrial designs requiring very low hardness leakage will use higher salt dosages and a more engineered hydraulic design to achieve ultra-low hardness from higher TDS feeds. Purolite, C100 Engineering Bulletin. 14 January 2010. “Softening Methods of Waters with High Total Dissolved Solids.” Purolite Engineering Report. 12 December 2006. C.F. ‘Chubb’ Michaud, CE, CWS-VI, is CEO and Technical Director of Systematic Company, which he founded in 1982. He serves on the Pacific Water Quality Association’s Board of Directors (since 2001) and chairs its Technical Committee. Michaud has also been a member of the Water Quality Association’s Board of Directors as well as past Chair of the Commercial/Industrial Section. A founding member of WC&P’s Technical Review Committee, he has authored or presented over 100 technical publications and papers. Michaud can be reached at Systematix, Inc., 6902 Aragon Circle, Buena Park, CA 90620; telephone (714) 522-5453 or via email, cmichaud@systematixUSA.com.